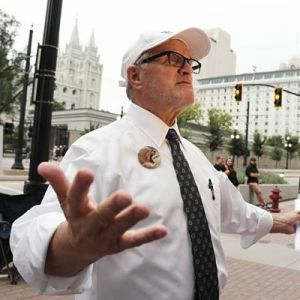 Congratulations to X-Mormon of the year 2018: Sam Young!!! Sam Young — a former Mormon Bishop — has spent the past few years shining the light on a shameful practice within the CoJCoL-dS: having untrained lay bishops give one-on-one, closed-door interviews with children and teens in which bishops are expected to ask the minors about their sexual experiences (chastity) and are allowed to ask for some pretty graphic and explicit details. This is a problem that has been hidden in plain sight for decades. Those who were raised Mormon know about it. I’ve read TBM comments online explaining that the bishop sometimes needs to ask for graphic details in order to determine what type of repentance is required. And I guess the idea is that if the kid feels ashamed while being asked precisely what their hands and other body parts did, then that’s good — they should be ashamed. The problem is that that sets up the perfect opportunity for abuse. Kids who think they deserve to feel ashamed certainly aren’t going to dare tell their parents about it, knowing the response is more likely to be “You did X?! You should be ashamed of yourself” rather than “X is a normal part of growing up, and this untrained middle-aged man had no business asking you about it.” Thanks to Sam Young for his tireless efforts to call attention to this practice that absolutely shouldn’t be treated as ordinary and acceptable. Sam Young caught the public eye in 2016 by voting opposed in General Conference. Over the past few decades, this voting procedure in the CoJCoL-dS has morphed into just a “sustaining” vote (in which “no” votes are inappropriate). But Sam Young argued that according to the scriptures the church should be governed by common consent, hence the vote should be a real vote. Since then he has been the primary organizer and driving force behind the Protect LDS Children organization. After hundreds marched with Protect LDS Children in protest of this policy and Sam Young went on a hunger strike, the CoJCoL-dS finally changed its policy — now allowing parents to sit in on the interviews. Well, yes, except that — in accordance with its usual M.O. — the CoJCoL-dS pretended that the change was a total coincidence that had nothing to do with the organization and demonstrations. In September of 2018, they thanked Sam Young by excommunicating him. Shame on the CoJCoL-dS, but a big thanks and round of applause to you, Sam Young — 2018’s “William Law X-Mormon of the Year”!!! Please get your Brodies’ nominations in as soon as possible on the intermediate nominations roundup thread — anyone can nominate! You can see the results of the X-Mormon of the Year voting here. Brodies 2018 – intermediate nomination roundup! Sam would also be Mormon if the year, as far as I’m concerned! He’s done tremendous work improving Mormon culture! Thanks, Sam! Just so you know, I view this as a big deal. It’s an honor. At this point, I’m definitely a part of the exmormon community and have valued your association, friendship and wisdom going all the way back to 2014. Thank you for your support for protecting LDS children. You were the first to pay attention, to step forward and to jump in to make things happen. As a result, Mormon children are safer today than they were a year ago. Thank you for that, my dear friends. The work is not done. Mormon children are still at risk. Major actions are in the works for 2019. They will big bigger than last year and make even more impact in saving children from physical and psychological abuse. I’m counting on ya’ll locking arms again with this excommunicated X-Mormon of the year to make history for the sake of our children. Sam should have been called as a general authority and praised for his insight into changing policies that can harm children. Instead he was excommicated. He has done a great deal of work. I’m glad he got this recognition. Congratulations, Sam! So thankful for all the work you are doing to Protect the Children! Keep up the good work. Thank you for forcing The Brethren to display their True Colors for all the world to see! Well … most of the world … those with eyes to see and ears to hear. The Brethren have forced you to set the Best Example of what should be ultimately be done with Church Membership. Put it in your Rear-View Mirror … where it belongs. Sam Young, you are my hero! Thank you for all you have done to protect children!! !